"Error is defined as the failure of a planned action to be completed as intended or the use of a wrong plan to achieve an aim" (Kohn et al. 1999). Annually, it is estimated that up to 98,000 people die from medical errors. This number is quite staggering when the whole purpose of the healthcare system is actually to provide better health to the population as a whole. This is higher than the deaths from motor vehicle accidents (43,435), breast cancer (42,297), and AIDS (16,516) for 1999. Apart from Fatalities, medical errors also cost the nation $29 billion dollars annually. The reasons for medical errors are vast and there are many differing opinions as to what causes these errors, but many will agree that healthcare errors occur as a function of flawed systems, not individuals. It is interesting to note that healthcare is a decade or more behind other high-risk industries in its attention to ensuring patient safety. In fact, until the Institute of Medicine's report in 1999, there was not a real call for intervention in improving patient safety. The healthcare industry is different from many other businesses because it is a service provided by humans and for humans. In other words, the reliability of the healthcare delivery system rests on people. Not only do all kinds of unique individuals provide healthcare, but also each patient is a unique individual with different needs. Unlike the manufactured components of a system, people differ greatly from one another on ever), physical and mental attribute that one can mention. One person may behave differently than another person in the same situation; therefore, addressing health issues requires healthcare professionals to make individual, case-specific, educated decisions. To modify, or change a behavior, we must first have an understanding of the values and leads of those who directly care for patients. "Without the knowledge and use of internal rewards to create and sustain key behaviors in providers, we have little chance of widespread, enduring improvement in the processes and systems of health care" (Kelley et al. 2001). There must be intrinsic motivation of healthcare providers, shaped by professional ethics, norms, and expectations. Diagnostic errors, as the name implies, involve the diagnostic process. This can include error or delay in the actual diagnosis. Studies comparing diagnoses to postmortem necropsy results indicate that 40% to 60% of diagnoses listed in a patient's chart are incorrect. These same studies state that the diagnosis error had a significant impact on patient outcomes in 10% of the cases (Goldberg 2002). Diagnostic errors can also include the Failure to employ the indicated tests that are used in the diagnosis process. Often, physicians are overloaded with procedures and might forget to ask for a certain rest to confirm a diagnosis. Physicians must also know all of the patient's medical history before ordering tests, but frequently not all of the patient's history is disclosed. Both situations can lead to the ordering of wrong tests or/lot ordering any tests at all, causing a misdiagnosis (Goldberg 2002). Furthermore, medical errors can occur if outdated tests or therapies are used, Medicine changes constantly. Each month new procedures are introduced and old procedures are proved to be ineffective. Physicians must stay up-to-date with new literature and new procedures to ensure proper diagnoses can be made (Mayer 2000). Treatment errors include errors in the performance of an operation, procedure, or a test. Inappropriate treatment can be caused by several factors: lack of information, limitations of diagnostic tests, and the physician's overall ability to make competent decisions can all lead to treatment errors (Goldberg 2002). Another type of treatment error can occur in administering the treatment, including dosage or method of medication such as injection, oral, or IV. Several studies indicate that medication errors are the most likely type of error that can occur. This is primarily because drug therapy is one of the most widely used interventions in the health care industry (Kohn 2001). However, a specific set of drugs cause the majority of errors. About 20 drugs cause 80% of all medication error deaths (Voelker 2001). This problem is so dangerous that the Veteran's Affair Hospital network has banned all potassium chlorate drugs because they cause so many problems (Rosner 2000). Treatment errors can also include a delay in treatment. Often times significant delays can occur prior to mandatory treatment, such as surgery, these delays can lead to more complicated procedures, which increase the risk of committing an error (DeCoster 1999). This category includes failure to provide the necessary prophylactic treatment to a patient. Prophylactics are drugs that aid in the prevention of a disease. Antibiotics, aspirin, and other similar types of medicine are designed to help the body fight disease. Failure of a physician to prescribe such medicines can lead to a patient acquiring the disease or other complications (Lesar 1997). 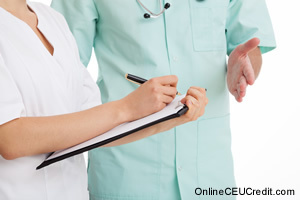 Preventive error can also come from inadequate monitoring or lack of follow-up treatment. Many complications can arise from major procedures such as surgery. Post-surgical wounds can easily become infected when not treated correctly. Also, other symptoms of post-surgical complications might go undetected if the proper follow-up treatment is not performed (Russell 1999). The preceding section contained information about preventing errors in healthcare. Write one case study example regarding how you might use the content of this section in your practice.